The bright planets - Mercury, Venus, Mars, Jupiter, Saturn - and Uranus as well as the Sun and the Moon (The seven wanderers known to the ancients), are the subjects of this applet. It provides different views: a diagram showing the rise and set times over the year, a view at the local horizon (rectangular, spherical, and polar), a view of the ecliptic plane, a sky map, and an earth map. or Shift key and y, m, w, d, h, n to decrease the year, month, week,date, hour, or minute. Use c or shift key and c to increase/decrease the century. Check your time zone offset and the local time. 1. a Diagram showing the rise and set times over the year, 3 different representations. The items of the Details menu, working in toggle mode, show and hide additional details. "Horizon Image" changes the background image of the Horizon View. 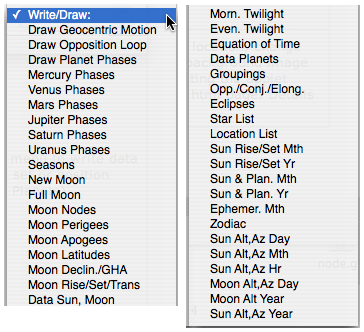 Choose from the Write ... menu to write data to a new window (rise and set or position data of the Sun, Moon and Planets). You may enter your home location, change the starting view and the background image of the Horizon View by editing the applet parameters of the planets.html page. Details here.